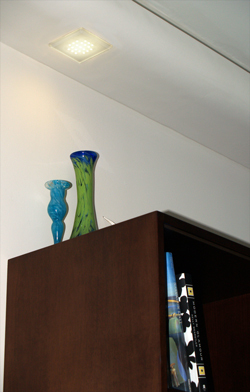 Model 21-450S, installed into a residential interior cove/soffit. 21-450S uses an array of 21 superbright, warm white LED lamps. 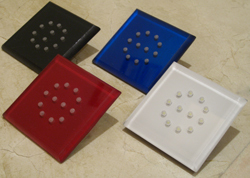 We can build our fixtures with any color or brightness (normal, bright and superbright) LEDs. LED Panel 21-300S has mounting flexibility for retrofits. Since it is so thin and light, it can be fixed to many surfaces with standard epoxy, screws, or the built-in magnets. 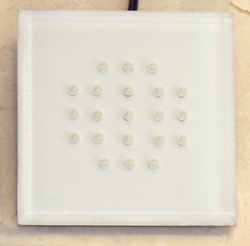 Fixed to the underside of the fixture are two surprisingly powerful, but tiny magnets (0.0625" thick x 0.5" diameter). This allows for mounting on any steel or iron object: a nail head, a cleat, a flat finished surface, etc.